Mercedes-Benz was having a grand old time in the 1950s. 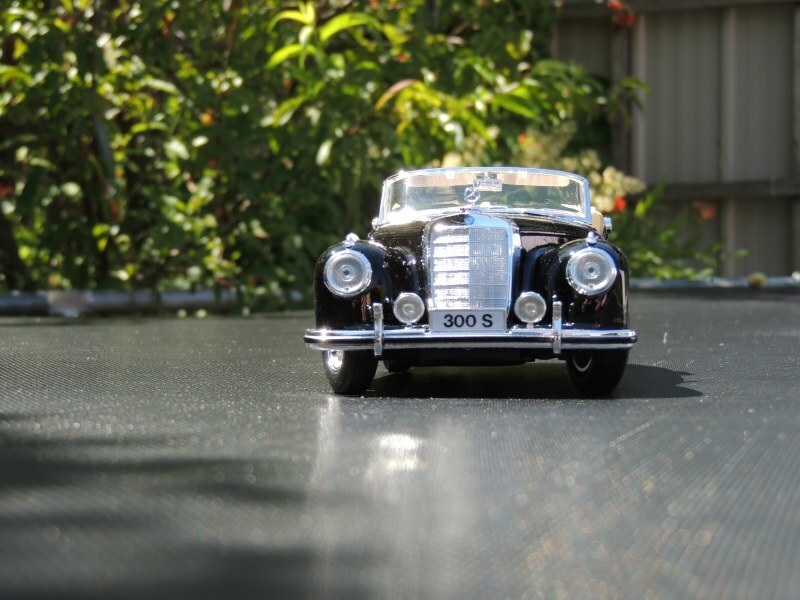 Having recovered from war losses and regained their original 1930s reputation for high-quality, desirable cars, they were now churning out a series of magnificent vehicles, including classics like the phenomenal 300SL, the elegant Ponton range, and the luxurious 300S. The latter enjoyed status at the top of the range, offering, at that time, luxury equal to the Rolls-Royce models and performance that surpassed them. 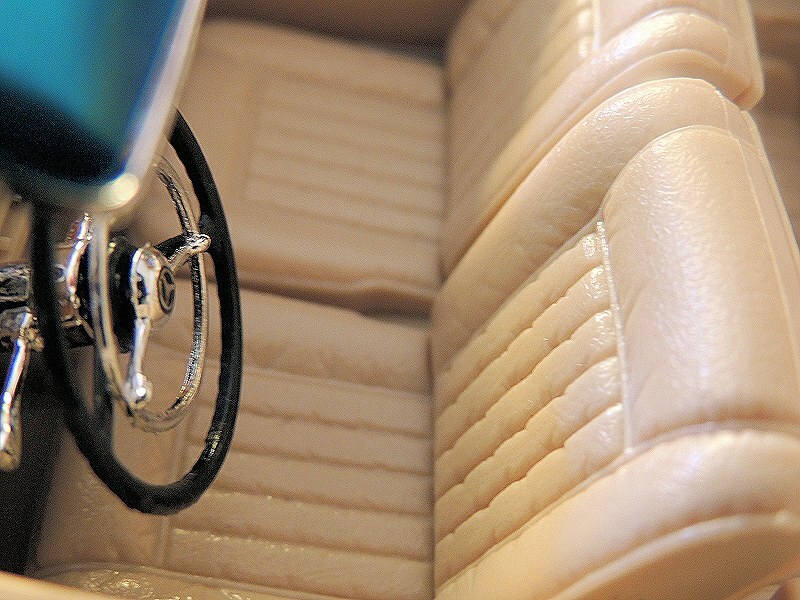 Such a beautiful and distinguished car surely deserves a place in your cabinet. And as far as I can discover, only two marques make a 1:18 scale model of the 300S. Mid-range brand, Norev, produces a green sedan, and budget brand, Maisto, offers a black 300S Cabriolet D (The Cabriolet D is the two-door convertible, the Cabriolet Adenauer is the four-door convertible). Unable to obtain the Norev, at least for the time being, I had to make do with the Maisto. 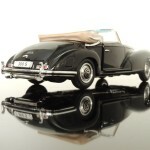 Maisto 1:18 ‘1954 Mercedes-Benz 300S Cabriolet D’. Yes, it is cheap and rather poorly finished in many ways. Yes, the chrome looks, um, ahem, compared to AUTOart standards. But wait! It’s completely unfair to judge a Maisto against an AUTOart, because there is an enormous price gulf between the two. Judge an AUTOart on what it has for $170, and judge a Maisto on what it has for $50. And considering that this smart Cabriolet D cost just that, it’s rather good. 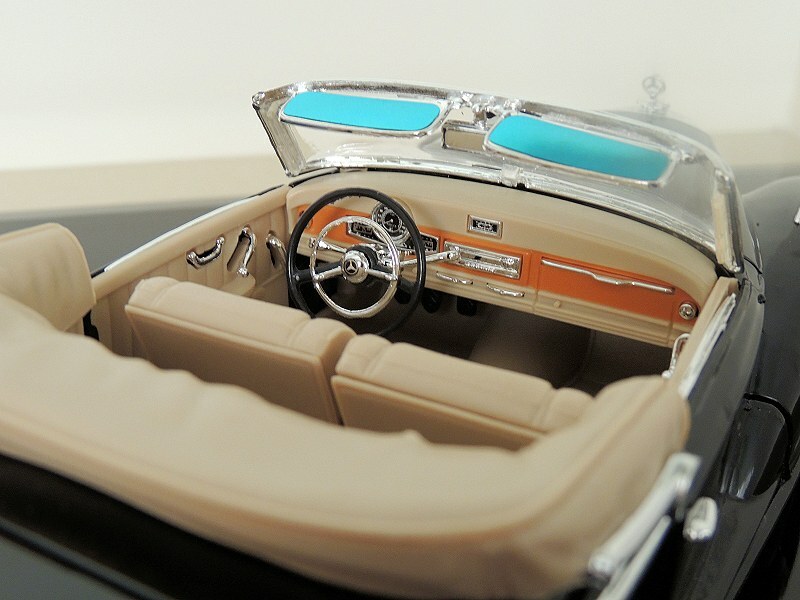 The beautiful exterior is well painted, there are no studs in the lights, and the chrome bumpers and adornments are not as glitzy or excessive as some of the other Maisto models. This could be due to the fact that it’s a quite a new model, only appearing into the catalogue this year. Unfortunately, the black paintwork, while good in most areas, is jagged where the right front wing meets the door. My only experience in painting being accidental application to myself, I am not sure what could have prompted this unsightly blemish – but at any rate, it’s probably just an individual problem. Yet another exterior disappointment is the quality control issue of a missing handle underneath the folded roof. It’s there on one side, but on the other side, there is nothing but black hole. A black hole which, I might say, constantly gives me an irrational urge to send an email to Maisto, imploring them, most sincerely, to check their factory vacuum cleaners for my missing handle. But, aside from those two individual problems, the exterior looks really good. The interior? A largely harmonious blend of good and bad. Fortunately, the former is the majority, with a well sculptured folded roof, a pleasing beige scheme with silver touches, and excellent seats. Truly, excellent seats. Not only are they realistically shaped and positioned, they are also intricately textured to imitate leather, with furrows and creases and what not. It’s a jolly good effort. But – and here we go – there are disappointments. The instrumentation – except for the gauges and the clock – is glitzy chrome at its zenith degree, and the background on which they are to be found is a bright blazing orange! It is supposed to look like wood! I wonder whether, back at the factory, the 300S dashboard was mixed up with that of a ‘90s French retro thing – for there is nothing in the bright orange that resembles wood. 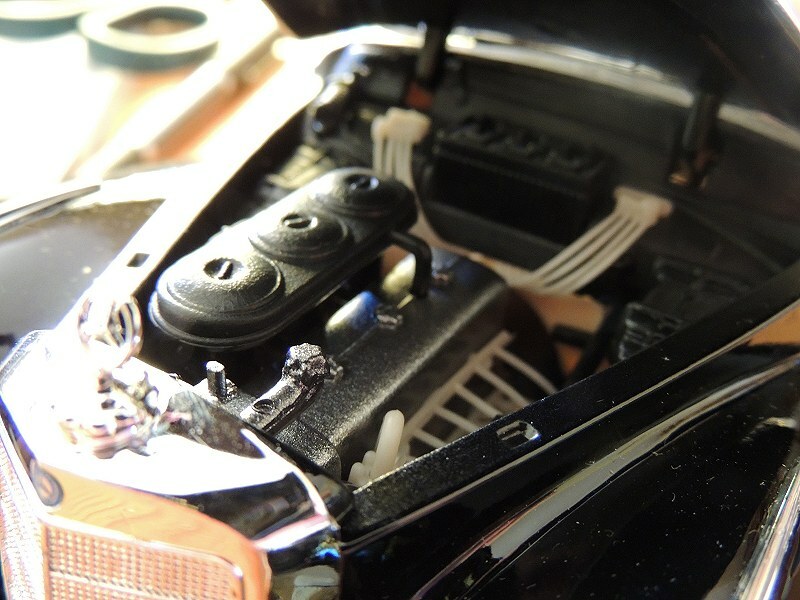 Another disappointment is the window cranks, which have a shadow of themselves behind them – the holes from whence they emerged when the model was put together. If you going to do individual cranks, don’t leave a hole. If not, just shape cranks into the plastic mold and paint them accurately like Sun Star does. Not impressed by your laziness in this department, Maisto! Opening the V-shaped bonnet is refreshing. Many of Maisto’s models have crude, oddly-coloured engines, but with a nice gunmetal grey motor ensconced by thin white leads, the 300S is not one of them. At the opposite end of the car, the boot is just as good. 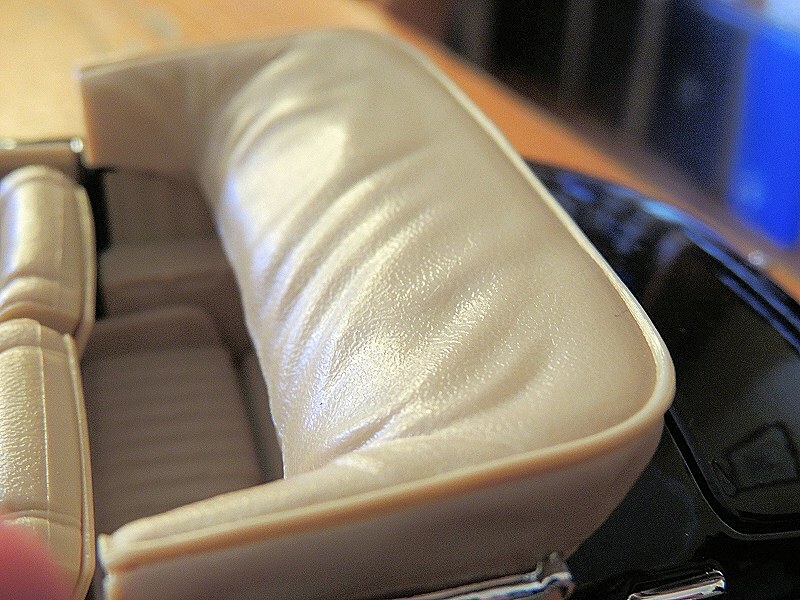 There is a detailed mat, a nice white luggage strap, and two, partially hidden spare wheels. While good in other respects, disappointingly, the spare wheels have a flimsy plastic centre which means that they bend like a trampoline if pressure is applied. Perhaps, though, I’m just being pedantic. 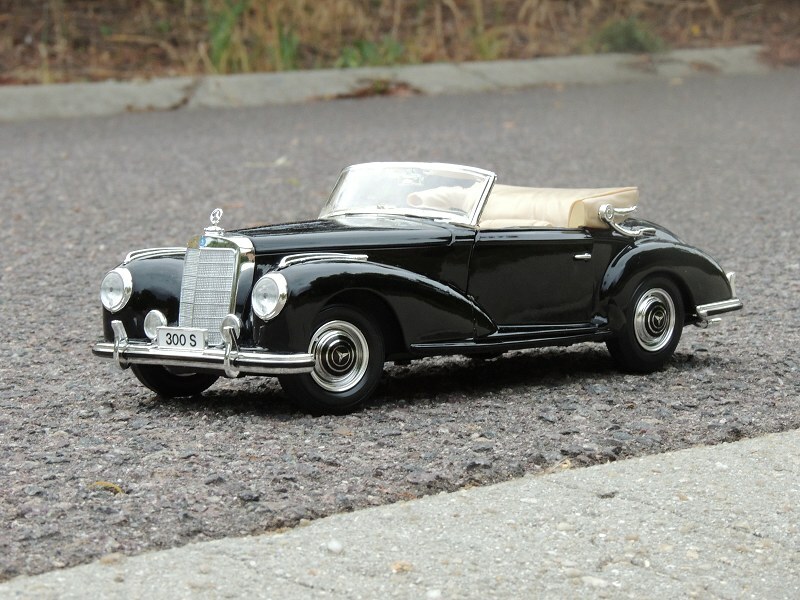 Yes, Maisto’s Mercedes-Benz 300S Cabriolet D has its faults. There are some quality issues, the windscreen has a flimsy plastic frame, the dash is orange (moan), and some of the interior instruments are ho-hum. But with a beautiful exterior, a largely commendable interior, and impressive engine and boot efforts, coupled with such low pricing, it’s not a bad buy at all. Would I recommend it? Yes, I would. Just, though, before you buy it, check that none of the handles are ‘absent without leave’. 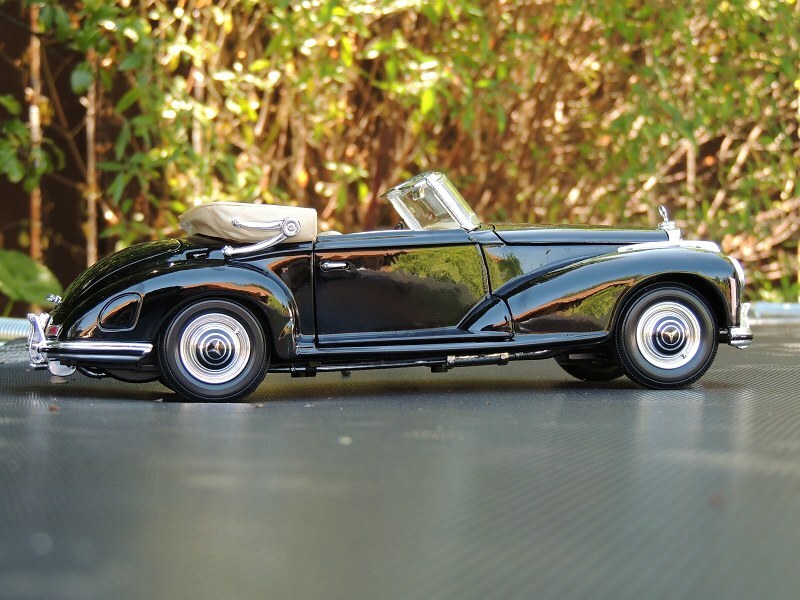 7 Responses to "REVIEW: Maisto 1954 Mercedes-Benz 300S Cabriolet D"
Are you aware that this is an old 1990s model? Readers might wrongly assume this to be a newly launched model, when it really used to be competition for the early Burago models. I paid for mine in Deutschmark long before the Euro was introduced. It´s nearlyy 20 years old now. To do it justice, this should be kept in mind. I am aware that it was once offered, however, there is a gap of over a decade since then. 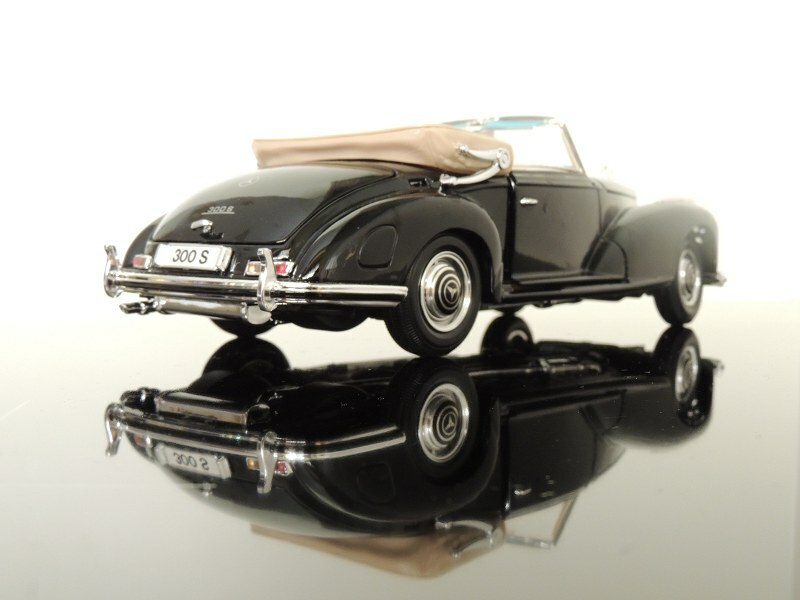 If a model has been offered, disappeared, and then remerged into the market after such a lapse of time, it is practically a new model and certainly should be equipped with modern diecast standards. Well, Maisto will be glad to hear that their 20-year-old model is still good enough by today´s standards for you to recommend buying it despite its short-comings. Obviously there is a market for bringing back old 1990s 1/18 models. I have a nice green one of these. I only buy Maisto @ Costco. Current Maisto prices are the highest they have ever been due to the Canadian Peso. Current price is $18.99 for the current range of Maisto cars. I think when I bought my green MB300s many years ago it was no more than $14. Never seen Maistos for $50 anywhere in the past. Hobby shops that sell Maisto here in Calgary Are in the $42 range currently which is ridiculous compared to Costco. Just my 2 farthings worth. It’s called crappy Canadian dollar. Yes, the fact that Costco sells Maisto models at less than half the prices of everywhere else is something to behold. It must have something to do with the quantity that Costco orders. I wish Costco would do the same with AUTOarts and the like! I got an old one of these but there is a lighter on the trunk. Was this a special edition or somthing?